Holland Circular Economy Week provides stage for signing the strategic partnerships accelerating and scaling up circular economy internationally. Both EYELEVEL and ECOR, and Orée and Holland Circular Hotspot, have formed partnerships around their shared visions. The announcement comes during Holland’s Circular Economy Week, a living lab of innovations and a breeding space for international partnerships. See full press release below. Freek van Eijk, Director Holland Circular Hotspot. Holland Circular Economy Week provides stage for signing the strategic partnerships accelerating and scaling up circular economy internationally. [The Hague, NL] – Both EYELEVEL and ECOR, and Orée and Holland Circular Hotspot, have formed partnerships around their shared visions. The announcement comes during Holland’s Circular Economy Week, a living lab of innovations and a breeding space for international partnerships. 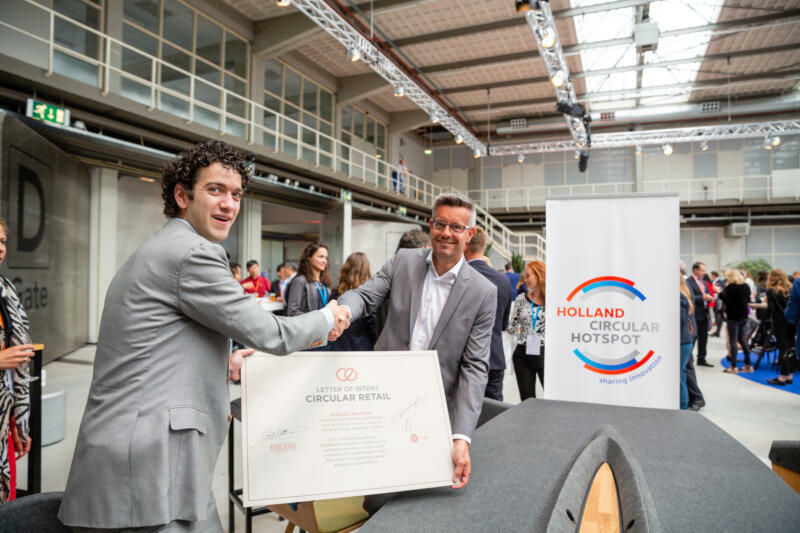 “We are proud to see international partnerships on CE coming to live at the Holland Circular Economy Week and we hope this is just the beginning of the acceleration and scaling-up of the Circular Economy.” Freek van Eijk, Director Holland Circular Hotspot. EYELEVEL’s heritage with retail experience design coupled with ECOR’s sustainable core material will yield retail products including point-of-purchase and point-of-sales displays, cabinets, signage, luxury packaging and merchandise materials. This collaborative portfolio enables brands to design and develop waste-free store concepts that are fully recyclable at the end of their use. “Brands now can choose to upcycle their own waste stream such as packaging materials, office paper and waste textiles into valuable brand concepts” says Eric Logtens, CEO of ECOR Europe and Global director circular economy. “This is an ideal partnership for EYELEVEL. As we drive our vision in building sustainable retail environments for the brands we love, we relentlessly pursue collaborative partners who are as equally conscious and purposeful,” shares Ben Jensen, Global Director of Design & Innovation. Both the Netherlands as France stated ambitions for a 100% circular economy and they are already working together on the transition. “Against the background of the roadmaps, this MoU should accelerate bilateral cooperation on different levels (national and local policy, business and knowledge). The transition is a systemic transition involving all parts of society and since it is impossible to be the front-runner on all levels at the same time, there is a lot to learn and exchange. The common themes can reinforce our transition towards a bilateral and European CE!” Freek van Eijk, Director, Holland Circular Hotspot.